Puzzle their brains with a little word scramble activity. Perfect for early finishers or as a computer terms unit supplement for the whole class. Kids will be learning spelling and recalling the names of various concepts they have learned as they unscramble the words. 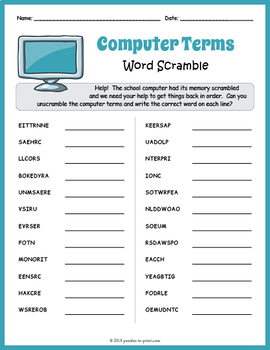 The 24 scrambled vocabulary words are: browser, cache, document, download, folder, font, gigabyte, hacker, icon, internet, keyboard, monitor, mouse, password, printer, screen, scroll, search, server, software, speaker, upload, username, and virus.